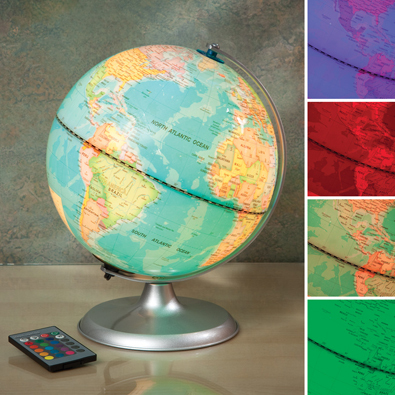 Explore the earth with this exciting light-up globe. Spin it on the sturdy metal base to find geographic sites. Plug in the power cord and use the on/off switch located on the cord to activate your globe, then watch the globe light up with stunning color combinations. The enclosed infrared remote control allows you to choose fifteen color shades and five lighting effect modes including fade out, color cycling, color transitions, speed changes and brightness adjustments. Measures 10" in diameter x 11" high. Requires 1 button battery for the remote, included. 72" power cord allows placement in most locations. Instructions included. A fabulous gift and educational tool for all ages. Gaze into an ever changing world of shape and colour within this fascinating kaleidoscope. Features two lenses for a unique viewing experience on either end and a clear center displaying the jeweled findings. Includes an elegant black stand measuring 3" x 1". Kaleidoscope measures 9" long. The Sandscape Sculpture is a rotating picture frame filled with coloured sand that creates unique, relaxing images every time you flip it over. Watch the combinations of colored sand and glow-in-the-dark glitter create ever changing and unique sand landscapes right at your desk. The same sculpture never appears twice. Ages 3+. • Rotating, acrylic picture plate base measures 8" x 5-5/8" x 1-1/2"